Is Traveling with Pets to San Francisco on This Year’s Agenda? Fun things to do with pets in San Francisco is easy to find on our San Francisco Travel Guide exclusive to pet owners. San Francisco is a stunning city with majestic views of bays, bridges, the Pacific Ocean. It is a top tourist destination for travelers worldwide and a Mecca for foodies and those in search of culture alike. San Francisco also is an extremely dog friendly destination with hotels, parks, beaches and outdoor café style dining perfect for you and your pooch. With this in mind, if you are traveling with pets to San Francisco, consider it a great destination as there are plenty of activities and sites to visit. While Fido is not welcome as you tour Alcatraz, San Francisco provides many options for doggie daycare and pampering while you take in the less dog friendly sites the City by the Bay has to offer. When it comes to hotels, travelers bringing their dog to San Francisco have options. Many of the area Best Westerns accept dogs with varying size/weight and deposit policies. Check with the individual location on their policy, which can be found within Vacation Pet Friendly’s many listings. For those looking for a posher experience for themselves and their hound, look no further than the Grand Hyatt in Union Square. The hotel’s official pet policy states that prior approval must be obtained, which can be done by calling 866-676-7078. As with many hotels, they reserve the right to charge a fee for the pet’s stay. Other options in the heart of the City are Kimpton’s Triton and Monaco San Francisco. Many Hyatts and Holiday Inns allow pets as well and are located throughout the City. As covered in the Guide to National Parks, San Francisco’s Golden Gate Recreational Area has a generous dog policy. From trails to wide open fields to beaches and forests, dogs have a pretty good life in Golden Gate Recreational Area. Large areas of the park are designated as off leash areas for dogs to run and frolic. Also consider visiting Dolores Park. This off-leash park is popular with San Francisco residents and pet travelers alike. 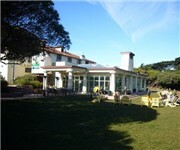 Park Chalet is a wonderful San Francisco pet-friendly restaurant. Ferry Plaza Seafood – located in the San Francisco Ferry Building overlooking the waterfront. When it comes time to take in a baseball game, visit Alcatraz, check out museums or do some shopping consider booking doggie day care for your best friend. Moulin Pooch is located in the Cow Hollow/Marina section of the city and provides doggie daycare, walking, grooming and cage free overnight boarding. San Francisco is a one of a kind destination for both you and your pet. Check out Vacation Pet Friendly’s hotel directory for new additions as you plan your San Francisco getaway.